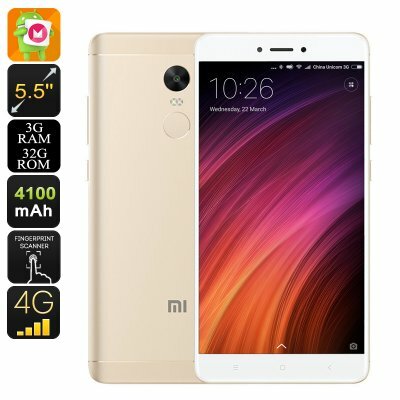 Successfully Added Android Smartphone Xiaomi Redmi Note 4X - Dual-IMEI, 4G, SnapDragon 625 CPU, 3GB RAM, 2GHz, 5.5 Inch FHD, Fingerprint (Gold) to your Shopping Cart. The Xiaomi Redmi Note 4X is arguably one of the most powerful cheap Android smartphones available today. Packing the epic Snapdragon 625 Octa-Core processor that has been clocked at 2.0GHz and 3GB of RAM, this affordable Android phone is capable of dealing with the most demanding of tasks without dropping a frame. Added to that, this Android phone also packs an Adreno 506 graphics unit that truly opens up doors for all mobile gaming lovers out there. Watch movies, play graphically demanding games, and enjoy the latest Android applications – nothing is too much for this amazing Android smartphone. No longer will you have to worry about storage space for your favorite files and media as, with 32GB of internal storage and a 128GB SD card slot, this Android phone supports oceans of memory. Supporting Google Play, this Android smartphone provides you with free access to literally millions of the latest games and Applications for you to enjoy on it stunning 5.5 Inch Full-HD display. Delivering crisp 1080p resolution, this stunning display is guaranteed to lift your mobile media and entertainment experience to entirely new heights. Supporting 4G connectivity, this Android phone lets you browse the web and download files at lightning speeds – making all annoyances related to a slow internet connection an issue of the past. Dual-IMEI numbers are in place to increase your overall connectivity even further. By allowing you to stay connected to friends, family, and colleagues through two phone numbers simultaneously, this Android phone is a great device for separating your work and private life. At the rear of this sleek Android smartphone, you will be able to find an ultra-fast fingerprint scanner that lets you unlock your phone and access your files with the simple touch of a finger. Above this great finger scanner, the phone holds a stunning 13MP intergraded camera that is capable of shooting stunning pictures and video of all those special moments in life. With this Android phone in your pocket, you can be assured that not a single moment will pass by uncaptured.